Yesterday it was raining. Hard. All day. 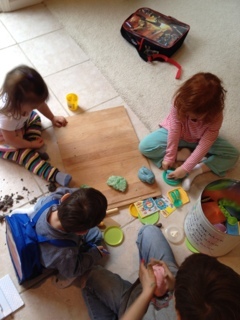 What to do with four young kids on a rainy day? Something that EACH kid will enjoy? Something that could occupy them for a LONG time? Something they could play together or in parallel? 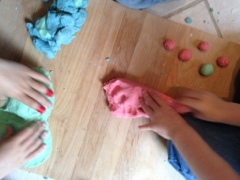 PLAY DOUGH!!! 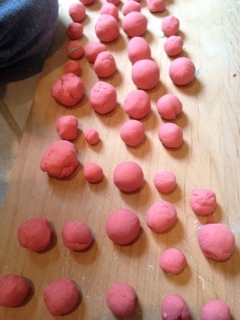 Let me tell you I took out our play dough gear (pretend oven, rolling pins, cut out shapes) but then saw that we had only one container of play dough left. And then it got worse. We opened it up and it was old, crusty, and a mixture of probably 20 different remenants of other colors. 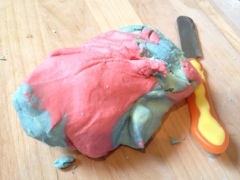 So it was a pasty, brown/grey glob of depressing playdough. Combine salt and flour, then add water and food coloring and combine until the right consistency (add more water if needed). We made several batches and the kids were entertained off and on through the day for at least 4 hours. Not lying. Not exaggerating. 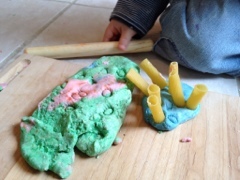 There were balls, snakes, lines of playdough, cutting, poking hard pasta in it, making pizza, making animals. I loved it since all four of the kids were playing – sometimes together, most of the time in parellel. They were sharing colors, exchanging supplies, sometimes working together on making lines of dough balls, etc. Big Bro made an “ocean” scene with a wave and everything. 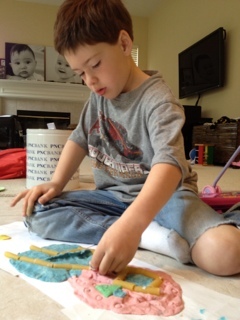 I was impressed at his creation (it is drying today – he wants to keep it). And I had fun making it with them and also playing make believe about how delicious the pizza was, teaching the twins how to roll balls, and combining colors. We put it in zip lock bags afterwards and it seems OK today; probably won’t last too much longer though. 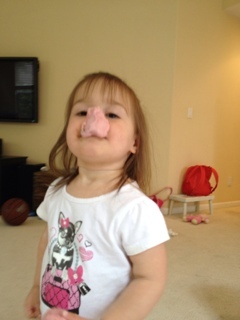 So next time you need something quick to do with young kids – take out the dough! It honestly was so easy and the kids got a charge out of making it and then playing with it. 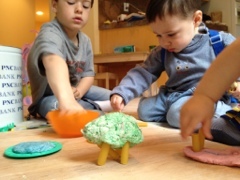 Might even work well with older kids who want to create something and then set it out to dry.